Our COMM-DRV/Lib Free version is a fully functional version of our serial communication libraries and DLLs. It is the same set of libraries shipped with the professional version of our product. The only difference is that it does not include the source code to the libraries. Some of the more esoteric serial communication functions are not found in the online documentation. The product provides full XModem, Ymodem, Zmodem, and ASCII file transfer capabilities. It include modem functions as well. I just want to take a minute to thank you for the software. I’m the one that wanted it for a senior design class at Iowa State University. It worked great. We gave our final presentation last Friday and the professors were impressed with our project. As a testimonial of how easy and well your software works, I’m an Electrical Engineering student with very little C/C++ programming experience. In fact I was in the computer science beginning level class when I began to use the software. Once I got started I had no real issues with making things work. Again thanks for the opportunity. Besides going to school I’m working for an equipment manufacturer that does control systems. I’ll encourage the use of this software whenever possible. I hope to find other uses for it in the future. 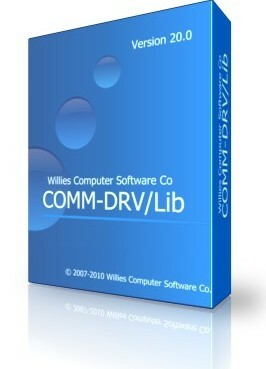 Download our fully functional FREE COMM-DRV/Lib Windows Serial Communication Library here. Purchase the full version of the package that includes complete source code to all DLLs and much more here.